Review Summary: It deserves to be watched for its captivating screenplay and striking performances. Tigmanshu Dhulia’s Shagird is about the Delhi crime branch, a law enforcement unit that gleefully perpetrates crime itself. Lines soaked with gallows-humour are all well and good, but a cat and mouse game can never work as well if the mouse isn't any fun at all. It deserves to be watched for its captivating screenplay and striking performances. Hanumant Singh (Nana Patekar) is the quirky cop in the police department. He is a man of action who delivers most of the time but he has unusual ways to accomplish his mission. So it’s Nana Patekar here at the centre of action. There is something about a Nana Patekar cop drama that makes one look forward to it despite the time lag that may have set in. 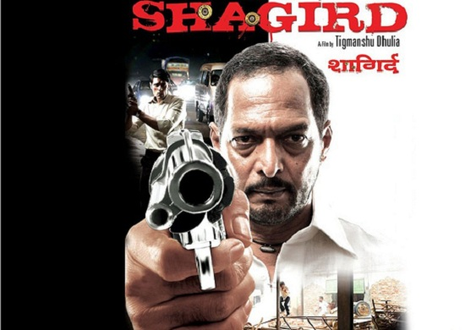 'Shagird', despite it's near to nil publicity and zilch hype, is one such affair that one wants to watch. Thankfully, the wait is worth it as 'Shagird' turns out to be a gripping unpredictable entertainer that keeps you hooked to the proceedings for it's two hour duration. Shagird with all its jaded sensibilities appears to be a film of the yore which has lost its market in the present times.